You know how I like simple activities. Above all, I like quick, easy activities that children are sure to love and don't require eight hours of preparation. I had forgotten how fascinating snails could be for children. Who wouldn't be impressed with an insect that carries its house on its back? In fact, an educatall club document inspired this article. Print the Snail body document (http://www.educatall.com/members/Documents/Document_4824.pdf) and have fun with your group. 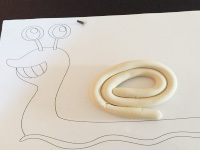 Of course, you may also use your imagination to create many other activities using the snail body. Using modeling dough, roll a long snake-like shape. Once it is long enough, roll it up on the snail's body to create its shell. Suggestion: Laminate the snail body so you can use it more than once. Psssst... If you like salt dough, make a salt dough shell. 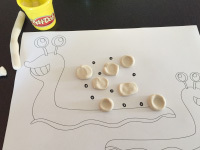 Set it out to dry before gluing it on the snail body to create a three-dimensional snail. Let children paint the shell as they see fit. 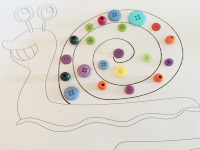 Use crayons to draw a coil-like shell for the snail. Arrange beads or buttons inside the coil. Glue them in place using white glue. With younger children, draw dotted lines children can follow to draw the shell. 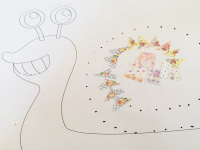 Draw dotted lines to represent the snail's shell. Have children glue tiny stickers on the dots to complete the shell. On each snail, draw a shell of a different color. 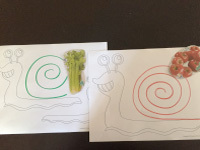 Cut pictures representing different colourful foods out of grocery store flyers and have children stick each one on the snail of the corresponding color. Draw black circles in a coil-like formation to represent the snail's shell. Prepare several modeling dough snakes and cut them into pieces. Place one piece of modeling dough on each circle and encourage children to press on them with their fingers to flatten them. Young children are quite fond of this simple fine motor skills activity.